Ever wonder what past lives you’ve had with your Twin Flame? Well, here is one of mine…. One of my past lives with my Twin Flame played itself out here in the beautiful Colorado Mountains as we were Native Americans. That is probably why we came to meet here, even thought neither one of us ever had been in Colorado in this lifetime. What a beautiful place to reunite. As the story goes, we each had belonged to different Indian tribes. Our tribes didn’t allow us to be together. Thus we each left our tribe and lived on our own in the wilderness. He did all the big game hunting while I did all the small gathering as the female. We were very happy together, until one day he died on me. I found myself alone in the wilderness, trying to survive. I couldn’t go back to my tribe since I had left and my tribe had disowned me. It was a hard, sad and lonely life for me after the death of my Twin Flame. However, I still feel so much fondness for that lifetime we had together, our love for each other and the beauty of the Colorado mountains. Every time I drive up into the mountains from the city, I feel it. A few years back, my Twin Flame and I had rented a cabin in the Colorado mountains and spent a couple of years living there together. 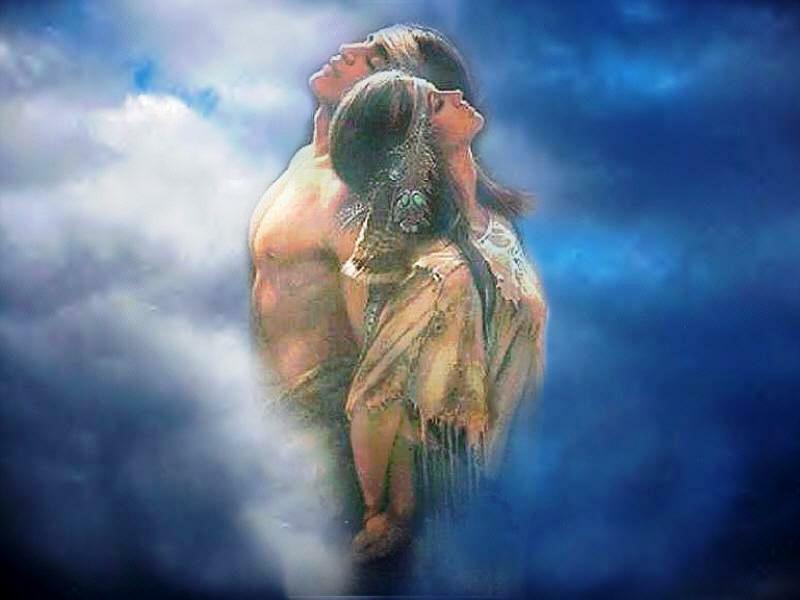 Later when we separated, we had not spoken for months, I had gone to a metaphysical book store and was mesmerized by a card that had the exact picture on it as I posted here, the two Native Americans leaning against each other back to back. I kept staring at it in complete awe at the love I felt between the two Native Americans. All of a sudden, out the blue, in that precise moment, my Twin Flame calls me. It was like he confirmed, and felt what I felt, the love we had for each other as the two Native American’s in that lifetime. We were both remembering it. How I came about this lifetime was when we separated, I felt like I couldn’t live without him. It didn’t make any sense, because, after all, I had lived without him my first 40 some years. Why couldn’t I live without him now? As a result of my profound sadness and the odd feeling that I couldn’t live without him, I embarked on some healing for myself (Quantum Healing Through The Subconscious, which I facilitate with clients) and healed all the lifetimes where I had depended on my Twin Flame for my survival. One of the lifetimes was this particular one where we had lived as Native Americans. After my healing I no longer felt like I couldn’t live without him, my sadness subsided considerably and I was able to move on. And if so, then perhaps you are wondering how to deal with the intensity? Here is a bit of information that may help you gain some clarity. Let’s first answer a few questions. So, you’ve met your match made in heaven? You are so intensely drawn to this person, it’s almost scary? Your heavenly match behaves in a way that is emotionally painful or upsetting to you? The intensity between the two of you is almost too much? You haven’t felt anything like it before? Sometimes all you want to do is move to never-never-land, disconnect your phone and burn all bridges behind you? It’s too painful to be with them and too painful to be without them? IF YOU ANSWERED YES TO ALL THE QUESTIONS, most likely you have met your Twin Flame and have some baggage to work through. A Twin Flame is literally the other half of your soul. You were born as one soul at one point in time and then split into two. Each of you has become a whole separate individual. Twin Flames love each other unconditionally. No matter what they have been through, they will always love each other. You will never experience this kind of love with anyone else. Right now Twin Flames are coming together in record numbers for the purpose of healing, working out old karma and spiritual growth. Because we are in the midst of a spiritual energetic shift and we are moving into higher dimensions, it is of utmost importance that we resolve our personal karma. This is an integral part of the process of increasing our personal vibration, making it possible for each individual to rise into the higher dimensions. Twin Flames mirror each other one hundred percent, thus forcing each other to deal with all their baggage. By baggage I am referring to the unresolved painful experiences from our past. I also call this karma. 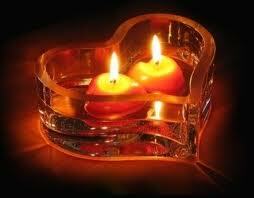 It is this unresolved business that adds significantly to the intensity between Twin Flames. It feels much like stabbing a knife into an old wound. On a spiritual level the hope is that when we connect with our baggage, we will resolve it. The natural process of resolving our karma on the physical plane may take years, even lifetimes of creating and living out the drama of our unresolved issues trying to learn our lessons. With spiritual healing this can be accomplished in a matter of hours. I personally have experienced the Twin Flame phenomenon. In 2005 I unsuspectingly met my Twin Flame. It was such a profound experience I wrote a book about it, “Meeting My Twin Flame”. I quickly learned that the only escape from the painful parts of the relationship was spiritual healing. One can easily feel stuck between a rock and a hard place in a TF relationship. While it can be excruciatingly painful to be with your Twin Flame, it can be just as painful to be apart from them. And sometimes Twin Flames need to separate before coming back together again because of their baggage. The best advice I ever got was from a shaman to make medicine out of it! Thus I will tell you, focus on yourself and resolving your own baggage. It doesn’t matter what your TF does or doesn’t do. You don’t have any control over what they do anyway. Your Twin Flame, like everyone else, has free will. Keep in mind that you can’t help someone who doesn’t want to be helped. I’ve come to learn that the hard way. Also, most likely your Twin Flame is busy mirroring your baggage to you and therefore can’t move on until you heal your stuff. However, you can do your part and heal yourself and resolve your baggage, bringing you closer to coming together with your TF in a more healthy way. Even if you are just working on yourself, the spiritual healing will shift the relationship dynamic enough to cause your TF to change at least their responds to you. 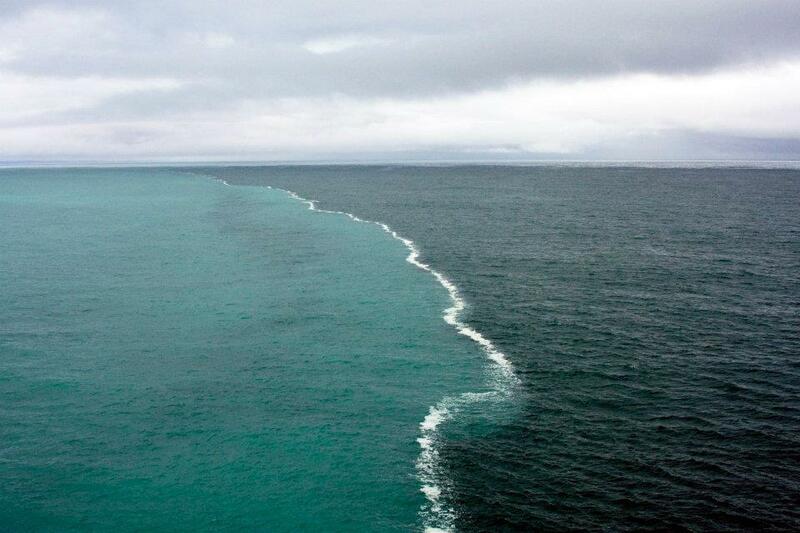 There is a place in the gulf of Alaska where two oceans meet, but do not mix. It is like the perfect relationship. You meet in the middle, but you don’t lose yourself in the other. You remain two whole and independent individuals in a healthy relationship with self and each other. And that is the ultimate goal you want to achieve. If any of this resonates with you, I would like to guide you through your personal spiritual healing journey that will ultimately help you achieve harmony with your Twin Flame. This is a life changing process that will improve every aspect of your life. If you are uncertain whether you have actually met your Twin Flame or whether spiritual healing would benefit you, you might consider a 30 min clairvoyant reading and consultation with me to gain clarity about your specific situation. Not quite ready to take this much action? 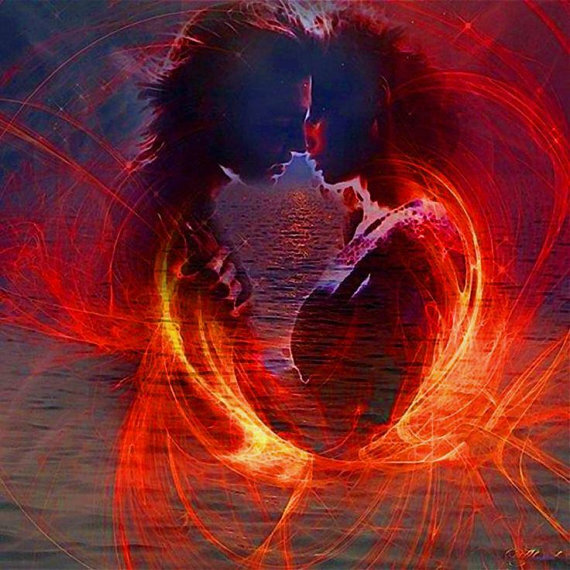 A twin flame is like a soul mate except that twin flames are born as one soul split into two. Each person is a complete and whole individual. However, the other person is literally the other half of your soul reflected in the strong soul level bond and love. The concept is not unlike that of physical twins except that the twinship is on a soul level. Therefore this phenomenon is called twin souls or twin flames. Everything is magnified by a 100 fold between twin flames; the love as well as the baggage. Consequently when there is a lot of unresolved business between twin flames the relationship can be so intense that it makes being around each other unbearable. Twin flames tend to feel each other from afar. There is a certain amount of telepathy between them and hugging feels like coming home. My understanding is that not everyone has a twin flame. To encounter your twin flame is certainly a unique experience and a gift from God. …but read more about this amazing phenomenon in my recently published book “Meeting My Twin Flame”, now available in print. The story is my personal account of meeting my twin flame and the profound journey it took me on. It might just change your perception about relationships entirely! Anyway, reading this excerpt gives me great hope in the light of pain and confusion. Perhaps you’ll feel the same way. If you believe you are in a twin flame relationship and would like to share your experience/s, I would love to hear them.